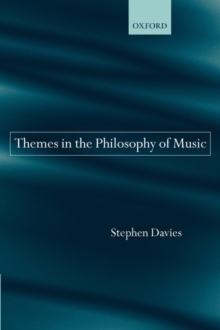 Representing Stephen Davies's best shorter writings, these essays outline developments within the philosophy of music over the last two decades, and summarize the state of play at the beginning of a new century. Including two new and previously unpublished pieces, they address both perennial questions and contemporary controversies, such as that over the 'authentic performance' movement, and the impact of modern technology on the presentation and reception of musicalworks. Rather than attempting to reduce musical works to a single type, Davies recognizes a great variety of kinds, and a complementary range of possibilities for their rendition. Among the questions that Davies considers are these: How can expressiveness be in a musical work when music experiences nothing? Is music a language of the emotions? How do recorded pop songs and purely electronic pieces differ from works created for live performance? Is John Cage's silent piece, 4'33", music? To what extent is the performer free to create her own interpretation and to what extent is she constrained by the composer's score? Is training in musical technicalities aprerequisite for a full appreciation of musical works and performances? Is an awareness of the socio-historical setting in which a work is created relevant to its appreciation? How does the value of individual musical works go beyond the worth of an interest in music in general? Stimulating and insightful both as individual discussions and as a coherent argument, these essays will be greatly enjoyed by philosophers, aestheticians, art theorists, and musicologists.